No one wants to spend $50,000 on a brand new kitchen that will look dated 10 years later. Kitchen trends can be fickle — popular one minute, then gone the next. Fortunately, not all kitchen styles come and go so quickly. In fact, the most popular styles have been around for years, and you can bet they’ll still be beautiful and functional 10 years from now. Traditional kitchens are timeless and refined, but they’re also sturdy and functional. Think Victorian era with an emphasis on symmetry and craftsmanship. 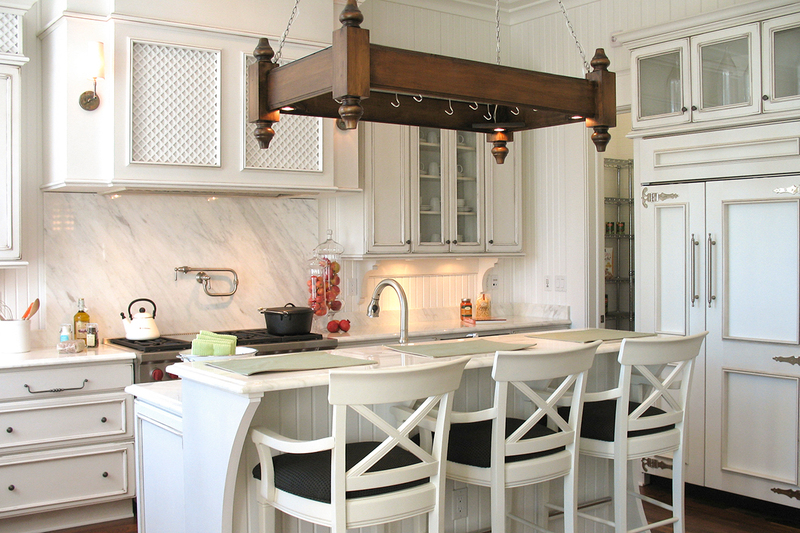 Let’s look at a few important elements that define a traditional kitchen style. If you think the traditional style is for you, your best choice will be classic countertop materials. Granite is made of 100% natural stone (not synthetic) and will fit nicely with other traditional elements. Looking for something even more traditional with an extra touch of elegance? Opt for marble instead! Both materials require a bit of maintenance — you’ll need to get them sealed every now and then to avoid stains — but if you spend a lot of time in your kitchen and want gorgeous countertops, they’re worth it! Traditional kitchen cabinets are often made of painted or stained wood. They’re typically simple and straightforward with carved wood and crisp corners. If it’s the traditional style you’re after, avoid high gloss throughout the kitchen, especially on cabinets. Transitional kitchens are similar to traditional kitchens, but with a slightly more modern twist. Although transitional design is generally simple, it leaves room for you to pick and choose elements from other styles too. 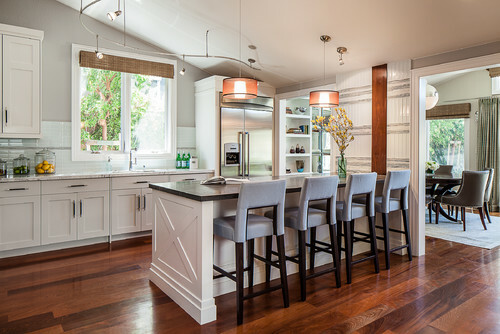 Want sleek, glossy countertops with stainless steel appliances and butcher block countertops? No problem. Transitional kitchens can experiment with rustic, industrial, and mid-century modern styles without losing their timeless aesthetic. Just remember, your goal is not to end up with a chaotic modge podge of design elements, but rather to mix and match traditional design with other styles in order to create a unified look. 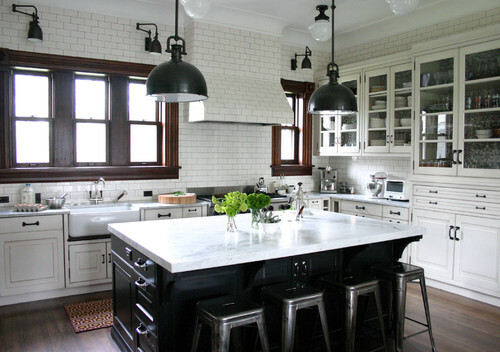 Natural stone and butcher block countertops are great for transitional kitchens. But unlike with traditional kitchens, you can also get away with using human-made materials here. Recycled glass is a great pro-environment option. Plus it’s durable and unique-looking. Transitional cabinets can be almost any style, as long as they blend seamlessly with the rest of the kitchen design. This kitchen’s simple, white cabinets are the perfect balance for the mid-century modern inspired lighting and chairs. Transitional kitchens tend to stick to light, warm colors, with warm browns and dark wood used sparingly. Whites, creams, grays and other light hues are perfect. If you love color and creative touches, look no further than paint! Paint makes your kitchen feel like a place where someone actually lives — not one that’s been staged for a photoshoot in Better Homes and Gardens. Paint allows you to experiment with textures and patterns to create a completely unique space. That’s right, even countertops can be painted. Just make sure you do it right, or you may end up with chipped, peeling paint within weeks. Laminate countertops are one of the easier surfaces to paint, so avoid natural stones, like quartz and marble, if you want to experiment with color. This colorful, eclectic kitchen shows how to rock a rosy red countertop. 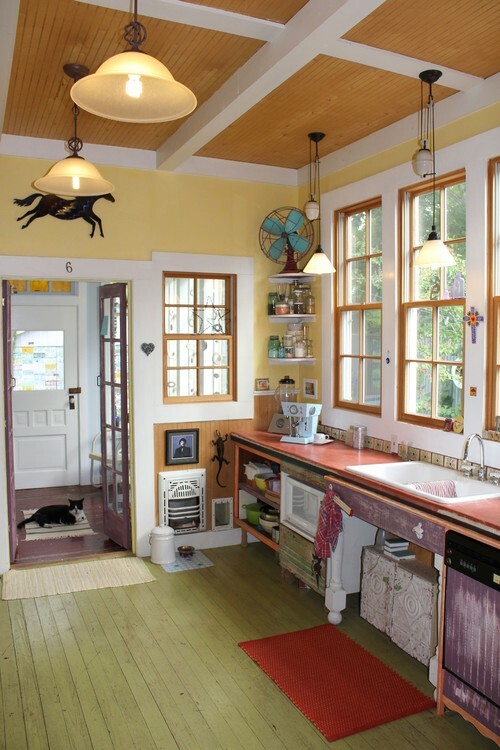 Walls and cabinets are the most popular place to experiment with paint. It’s also much easier to repaint over them later than it is with countertops, so don’t be afraid to go bold! For a clean look, stick to a single color palette, or keep cabinets simple and neutral to showcase designs on the walls. Eco-friendly kitchens can be of pretty much any design style, but there are so many environmentally friendly options available today that they’re worth talking about. You can make sure your kitchen is kind to the environment by looking for materials that don’t require a lot of cleaning and maintenance, which requires a lot of water and harsh chemicals. Recycled and recyclable materials are easy to find and often surprisingly inexpensive. Energy-efficient lighting and appliances are a win-win — they’re good for the environment and they save you money on your energy bills. Reclaimed wood is a wonderful choice for cabinets and countertops, especially if you like a rustic or farmhouse look. Recycled glass is another option that’s attractive, sturdy, and very eco-friendly. Bamboo is great for floors and cabinets. But you can find recycled materials in almost any form, including plastic, paper, and stainless steel. These are the most popular kitchen styles, and the ones our clients ask about the most, but which style is best for you? There are a few things to consider. First, the best kitchen style will be in line with the rest of your home. You probably don’t want austere dark-wood cabinets if you live in a light, airy beach house. Second, think about what’s most important to you and let that thing guide the rest of your kitchen decisions. Do you want brand new, state-of-the-art appliances and gadgets? Those might look best in a more contemporary transitional kitchen. Or, if protecting the environment is your top priority, getting your hands on the right materials may be more important to you than color choice. Finally, and most importantly, the right style for you is the one you like best! Design rules are helpful for people who need a little direction, but the truth is, there aren’t really “rules.” It’s your home. If you know what you want, go for it! Have more questions about kitchen styles? Our designers would love to help.